This post will run you through what you can expect when you go to view your potential new horse for the first time. Every horse and situation is different, but this post should be roughly what will happen when viewing an all purpose riding horse. When you first arrive the horse should be waiting for you and be un-tacked. This gives you the chance to have a good look at the horse. Look and feel the horse all over, and if you bought your experienced friend, get them to do the same. You are looking for any signs of heat, swelling or previous injury. While doing this, keep an eye out for the horse’s reactions. You should also see the horse walk and trot up on level and preferably hard ground. This is another opportunity for you to look for any problems with the horse. Next is the fun part, the riding part. You should watch the horse be tacked up, again looking for any signs of discomfort. Although lots of horses can be grumpy when being tacked up, especially when it comes to putting the saddle on and doing the girth up, it is important to not rule out a physical problem, especially if the horse appears to be very nice natured the rest of the time. Back pain and gastric ulcers are both potential causes of tacking up grumpiness! The seller should have someone to ride the horse first. This is important for 2 reasons, the first being that it helps keep you safe. If the horse is particularly difficult under saddle, seeing someone else ride it first will give you an idea of how bad the horses behaviour is and you can then decide the horse isn’t for you before he potentially throws you over the fence! Secondly, it is important to see how the horse moves and behaves under saddle. The person riding the horse will likely know the horse fairly well, so should be able to get the best out of the horse and show you what it is capable of. 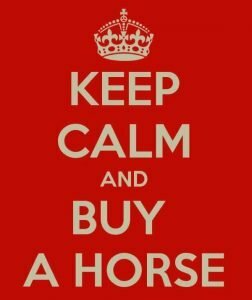 Before you get on, the seller should have the horse show you he is capable of doing everything you want to do with him (if not more!) If the seller isn’t willing to show you something before you get on without a good reason, I would be a bit wary about doing it for myself. Once you get on, take it slow. Just because the horse has been warmed up for you doesn’t mean you should head straight to the jumps! When I get on any new horse I always walk a circuit, not asking too much of them and then start asking a bit more. I would personally start with some walk-halt-walk transitions before going into trot, but that’s just personal preference. I would have a good few circuits in trot on both reins including transitions and circles etc before asking for canter. If you pick up that a horse has a stronger and weaker rein while trotting round, I would choose to ask for canter on the stronger rein first. If you are buying the horse to do some jumping with, I would jump it too. Ask to have a cross pole and trot into it the first time. Then canter into it and maybe try it on the other rein. How high you decide to jump is very much up to you/the seller at the viewing. When I was trying horses, I don’t think I jumped anything big! I had seen the horse jump to a reasonable height and for me, going over a cross pole/small jump a few times at trot and canter tells me enough about the horses jumping style and approach for me to decide if I like it or not! Depending on the sellers location and facilities, you may also get the opportunity to see how the horse behaves out hacking on the roads and in open fields. Although this isn’t always an option on the day, most sellers are happy to arrange a second viewing somewhere where you can experience a bit more with the horse if you’ve shown an interest. A sweaty horse when you arrive – they might have given the horse a hard workout before you arrive to take some of the naughty spark away, it could also be a sign of sedation! Similar to above, any other textbook signs of sedation. Why might the horse need sedating? The seller not seeming to know much about the horse. I have no problem with dealers, many of them do a good job. But I would be wary about buying from someone who doesn’t appear to know the horse very well as how can they give you a good account of the horses behaviour and physical history? I hope this post has given you an idea what to expect when going to view a horse. But remember, every horse, seller and buyer is different. So if you view 6 horses, every viewing might be completely different. Read the final post in the series, You think you’ve found the one.